Bianca Blair is one of the contestants in the inaugural Mae Young Classic. Bianca Blair remembers when her life was at a standstill. Working as a sales representative for a flavoring company in Atlanta, Blair felt like she lived her life on autopilot, devoid of any semblance of the athletic lifestyle she had pictured for herself after graduating as a track star from the University of Tennessee. Her job required a maximum physical output of picking up and putting down a telephone. "I was just settling," Blair said. "I was trying to live the life I felt was the hand I was dealt. I thought there would be something bigger, but this is what it is." It wouldn't take long before the former track star followed her competitive spirit to her latest athletic venture: professional wrestling. Today, Blair is an up-and-coming star in NXT, the WWE's developmental division, as well as one of 32 participants selected from around the world to participate in the first-ever Mae Young Classic, premiering on the WWE Network on Monday, Aug. 28. She now has an opportunity to elevate her newfound career and to prove to a sizable viewing audience that for once in her athletic career, she's more than just potential. Years before stepping foot in a wrestling ring, Blair was a standout collegiate hurdler, despite a volatile six-year track career that included stints at the University of South Carolina and Texas A&M, as well as a year of "giving up" before becoming an All-American and All-SEC selection at the University of Tennessee in 2012. In her final season at Tennessee, Blair recorded a personal best time and was ushered toward a professional career by her coaches. But for Blair, running had already fully served its purpose, one she used primarily to earn a scholarship and alleviate the financial burden of a college education on her parents. "I feel [track] got me where it needed to get me to," Blair said. "It got me a scholarship into college and it took care of college. It just felt like a chapter that I needed to close and move on from there." Blair had originally scripted a future in the national fitness craze CrossFit after stepping off the track for the Lady Vols. She competed in the CrossFit regional circuit until an overuse injury immediately derailed any future she had in the industry. "I have shifting rib syndrome," said Blair of her injury, formally known as intercostal chondritis, described as inflammation of the cartilage that connects a rib to the breastbone. "There's no treatment, there's no surgery, there's really nothing you can do for it. I went to a million doctors and chiropractors, and nobody could tell me what was wrong. I was really defeated." Unable to surrender her appetite for competition, and underwhelmed by her day job, Blair planned her next athletic pursuit, deciding to trade the open air of the track for the confines of the squared circle. "I want to be a wrestler," Blair recalled telling her mom, Travonda, bluntly in conversation. Blair had a distant familiarity with the industry, having watched the WWE as a byproduct of her older brother's fandom. Despite her mother initially not buying into the idea, Blair entered her info into the WWE database on more of a whim then with an actual plan. A week and a half later, Blair received a message on social media. "Have you ever thought about being a WWE wrestler?" the message asked Blair. It continued, "I can get you a tryout, but you have to do the rest of the work." The sender of the message was none other than 20-year WWE veteran Mark Henry, who had come across Blair's profile through the CrossFit circuit. "I just thought this was so ironic," Blair said. "So many times throughout my life I tried so hard to make things work with track or with CrossFit. All the pieces were just coming together, and I had to go for it. This is for me. This has to be for me. There's no way that all of this is lining up perfectly." After two tryouts, Blair signed to the WWE in April 2016, and later made her first appearance on NXT that June. In September, Blair shined in the Performance Center "PC" Combine in Orlando, which featured current NXT superstars and recruits who competed in a slew of athletic workouts, including 60-yard sled shuttle sprints, overhead medicine-ball tosses, trap-bar deadlifts and bench pressing for maximum repetition. Blair finished as the best overall performer of the combine. 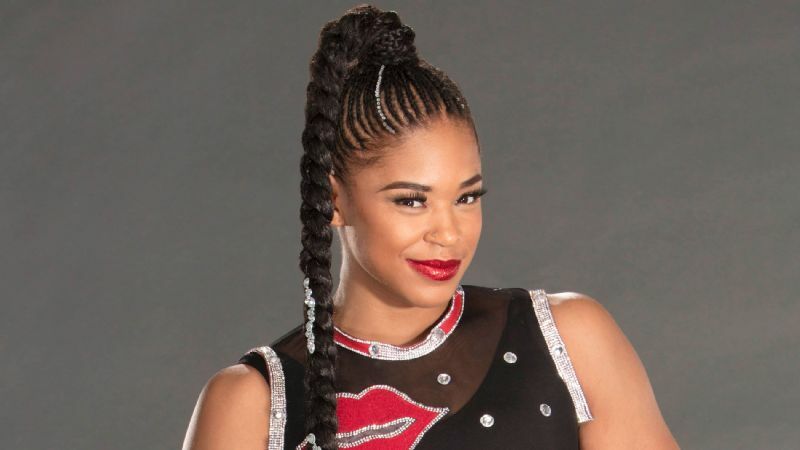 Blair gave WWE brass a performance that encapsulated the nickname she's coined for her character, "Bianca Belair," "The EST of NXT." As Blair describes, she's the fastest, the strongest, the quickest, the roughest and the toughest -- emphasis on the "est". However, winning the PC combine and topping the NXT field turned bittersweet for Blair upon reflection. Despite coming out on top athletically, Blair still had yet to debut in the ring; she still hadn't had a real match. Like many former athletes who've tried their hand at professional wrestling by believing that their talent alone could get them to the main event, Blair hastily understood that premier athleticism was just half the battle in this industry. "It made me realize that I could be the best in the weight room, but then I have to transform it to the ring. It's two completely different things," Blair said. "You can be the best athlete in the world, but if you're not entertaining, you're not going to make it." For a track athlete who had become so accustomed to the tunnel-vision formula of starting line, running lane and finish line, wrestling added a new element -- one that went against everything she was taught as a sprinter. Now, instead of tuning out the screaming fans on her way to the finish line, she has to both acknowledge and entertain them. Blair admits, the journey has been a process. "It's been a challenge finding the groove of being athletic and being a performer but also being entertaining at the same time," said Blair, who made her first in-ring appearance on Sept. 29. "I've focused on finding the character that fits me and is natural to me so that I can portray it correctly." Now, almost a full year since debuting in the ring, Blair continues to search for her place within the WWE. Whether it's working on fine tuning her character or popping her ribs back in when they occasionally slip out, Blair is focused on a list of goals that extends as long as her signature black braid, which conveniently doubles as an improvised whip in the ring. "Being a part of something which is tied to Mae Young, who was a legend and someone who was a pioneer for women's wrestling and created so much history ... means so much to me," Blair said. "Now I am able to be a part of history." While Blair may claim to be the "genetic beast" of NXT as the strongest and toughest competitor on the roster, no "est" is more important to Blair than the driving force behind her entire athletic career -- to be the best. "Every single day I'm here to prove [Mark] right and show him that what he saw in me is there," said Blair, who remains forever indebted to Henry and his faith in her potential. "It's been a challenge, but I'm extremely grateful to be here and am excited for what's to come."